Another card for Papertake Weekly Challenge i hope it is ok to Submit Two Cards...Spots/Stripes either or!! Hi Sylvie what a lovely card good luck with the challenge. Great card, love the colours, appeard on my dashboad 3 times, don't know why. A gorgeous colourful card. Love your image and those stunning flowers set everything off a treat. I hope you had a good Easter break. Oh wonderful card Sylvie, what an adorable image. Love this Sylvie - the colour combo is fab. We've been having some of your lovely weather here for a change! 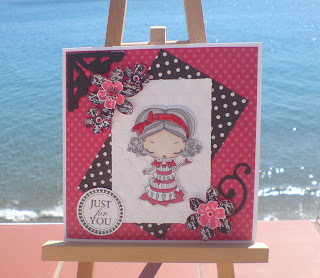 This is beautiful, love the sweet image and the colour combo is fab, and...I can see the sea!